If you love the idea of having an aquarium, but don’t want to commit to maintaining a large tank, a Betta fish tank may be the best option. Betta fish are small, vibrant, and easy to care for, and Betta tanks don’t take up much space, making them the perfect decoration for your desktop or nightstand. In this review, we reveal our top 5 best Betta fish tanks that are sure to breathe life into your home! 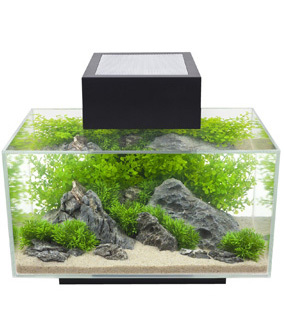 The best performers in our review are the Fluval Edge, EcoQube and Tetra Cube. Here’s more information on choosing the right Betta fish tank for you, along with a detailed review for each product we chose. You’ll usually see Betta fish hanging out alone, and in relatively small tanks. This species is known for its territorial nature, and two males should never be kept in the same tank; they’ll fight, often to the death. Aquarists that like the idea of having multiple Bettas often buy several aquariums and house them separately. 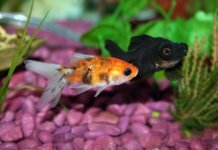 Almost all Bettas that you’ll see in fish bowls and pet stores are males; females are less colorful, have visibly smaller fins, and are kept in “sororities” of at least five fish. While females are somewhat less aggressive then males, it’s not a good idea to keep a male and a female together, except during breeding. Does my Betta fish tank need a filter and a heater? Betta fish thrive in temperatures between 74 and 80 degrees. If the temperature in your aquarium is lower than 74 degrees, a heater is advised. Bettas are a tropical species, and won’t react well to colder temperatures. Unfortunately, many Betta fish bowls on the market simply don’t allow enough space for a heater, let alone include one. We’ve put emphasis on aquariums that have enough space – both for your Betta and for additional equipment. An aquarium filter is always advised, regardless of the type of fish you’re keeping. However, Bettas come from stagnant waters, and can get stressed from strong currents of some filters. To top it off, their long fins may get caught in the filter, especially if the aquarium is too small. If a Betta fish tank comes with an included filter, the flow should always be gentle. We liked: Filtration and lighting included. We didn’t like: Small water surface area. Our #1 best Betta fish tank. Many manufacturers forget that an aquarium’s main purpose is to be visually pleasing. If you’re planning to buy a Betta, your usual choices usually boil down to either a fish bowl or a tiny cube. With this in mind, the Fluval Edge is a refreshment. The design is absolutely stunning; the aquarium itself is propped up on a pedestal, with all six sides visible for your viewing pleasure. The lighting, filtration, and wiring are conveniently out of sight, tucked away in the center column. This unique design gives off an illusion of a floating, seamless cube of water. You should be able to find the Fluval Edge in two sizes: 6 gallons and 12 gallons (which is more than comfortable for a Betta fish and can accommodate a heater, decor, and plenty of plants if needed). If your Betta is friendly, you can use this additional space to add a couple of peaceful community fish as well. Unfortunately, Fluval Edge’s beautiful design comes with a flaw. The water surface is hidden under the small lid on the top, where the filter outtake is located. Betta fish, which are able to breathe air, need access to the surface at all times – and they usually don’t like going near the water flow. While most owners we’ve reviewed claimed to have no issues with the design, some Bettas may be confused by it. We liked: Fun and unique. Low maintenance. We didn’t like: Plants may require sunlight – but sunlight can cause algae. And now, something completely different. 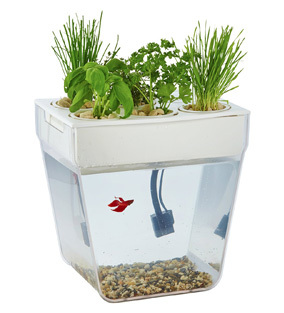 The market has seen a boom in aquaponic fish bowls in the past few years. Many of these products make very bold claims – the main one being that no water changes are required, ever. How is this possible? The top of the tank has six pods that can house several plants. The idea is that toxic waste produced by the Betta fish is absorbed by the plants. This helps them grow, and acts as a natural filtration system in return. 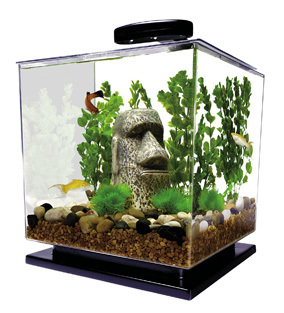 The result is a self-cleaning aquarium that requires visibly less maintenance than a typical Betta fish tank. While great in theory, this system has some faults. Without regular water changes or cleaning, the water can become dirty and full of algae. 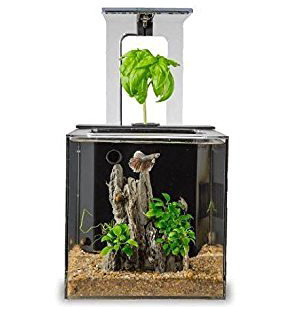 If you decide to buy this tank, we suggest getting a snail, or a couple of ghost shrimp, as they will help keep the water clean. Thankfully, there’s plenty of room for that – at a capacity of 3 gallons, this aquarium should be able to house one peaceful Betta and a neighbor or two. We liked: Good price-to-quality ratio. We didn’t like: Not as good as some other options. 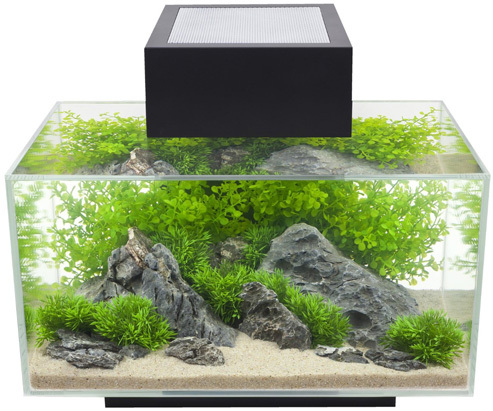 If you’re looking for something simple and affordable, the Tetra LED Cube Aquarium Kit is a great choice. It doesn’t offer any crazy features, but it does everything a Betta fish tank needs to do – and more. 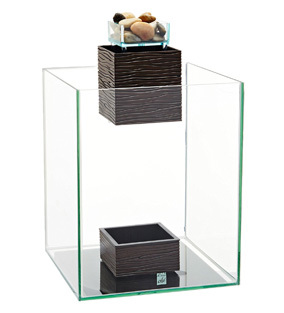 The Tetra Cube Aquarium has a total capacity of 3 gallons, allowing more than enough space for your Betta to swim around. The measurements are 10″ x 10″ x 10.5″, making this tank compact enough to fit on your desktop. Still, there’s enough room to include a small heater and a few plants for your fish to enjoy. The tank also includes a modest (but sufficient) filter, ensuring a healthy environment for your Betta. The LED light included with the tank won’t be enough to grow demanding plants – but it does the job, and gives a nice view of the tank. While the construction is plastic, it’s shatter-proof, and just as transparent as glass. The seamless edges give this Betta tank a very sleek look. Overall, we found that the Tetra Cube is sturdy, affordable, and a go-to if you’re looking for an entry-level tank for your Betta. 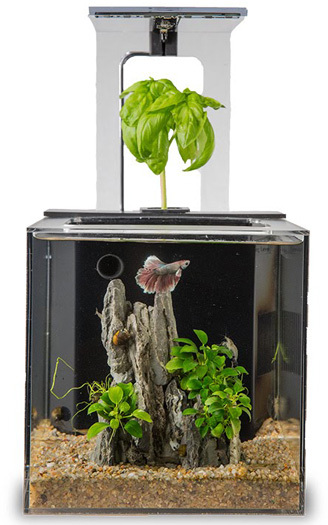 Still, despite its simplicity, it offers more than many similarly priced Betta aquariums. We liked: Relaxing and beautifully designed. We didn’t like: The extra decoration light can’t be turned off. If you’re a fan of the saying that “less is more”, you’re going to love Fluval Chi’s clean look. Despite its minimalistic design, the Fluval Chi comes with everything you need to get started. 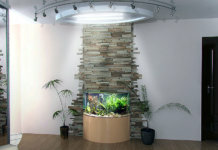 A small filter and LED lighting are included with the aquarium. 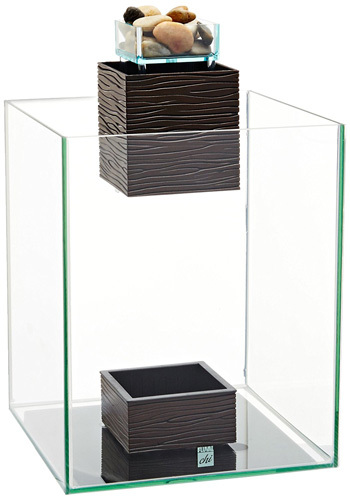 Both the filter and the lighting are concealed inside the seemingly “floating” box on the top. The filter pulls water from the aquarium, and releases it back through a small stream – resulting in a calming sound of flowing water. The filter provides a very gentle flow – perfect for a Betta fish, however if you plan to use this tank for anything more, we’d advise buying a stronger filter. The top box is decorated with an additional blue light, which is permanent, and can’t be shut off without unplugging the filter. If we had to pick one flaw about this fish tank – this would be it. If you plan to keep it near your bed, the top light is sure to annoy you at night. On the upside, the Fluval Chi has an impressive capacity of 5 gallons and that’s great. 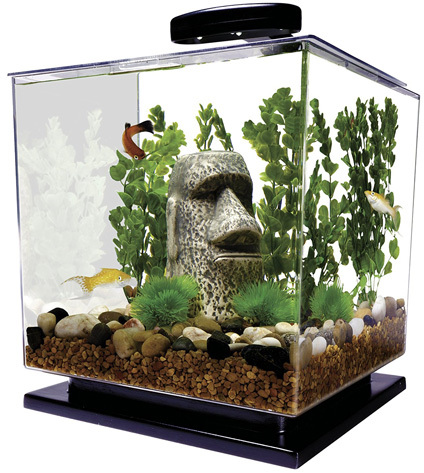 Most Betta fish tanks we’ve come across are considerably smaller. The measurements are 10″ x 10″ x 14″, allowing you to place this tank almost anywhere. We didn’t like: Slightly smaller than ideal. 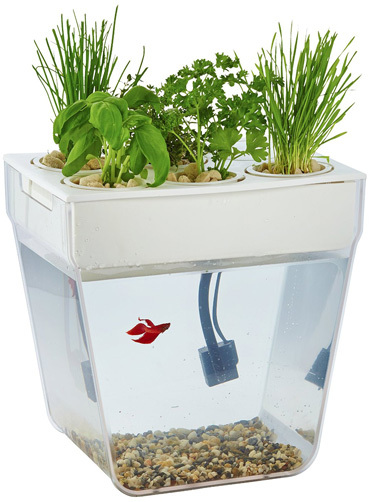 Similarly to the Back to the Roots garden, this Betta aquarium boasts with its low-maintenance system. Its filter relies on a live basil plant, which consumes the toxic waste in the water, acting as a natural source of filtration. No water changes are required. The concept is topped off with a cool design – the EcoQube Betta tank is beautifully hand-crafted from flame-polished acrylic and comes with LED lights for better viewing pleasure. We should note that the live basil plant doesn’t come with the product, and you need to plant the seeds yourself. The plant can take up to two weeks to grow and during this time, the water could be unsafe for your Betta. Although this may seem tedious, remember that patience is everything in fishkeeping, even if you only own a small Betta tank. The biggest problem we had with the EcoQube was its size. At a capacity of 1.5 gallons, it’s visibly smaller than any other Betta fish tank in this review. Bettas like having some space to swim. Without water changes, algae may become a problem, and this tank just feels too crowded to introduce shrimps, plecos or other algae eaters.